Londoners love a lie-in, which is why a good weekend brunch has become as ubiquitous as a sandwich al-desko during the working week. 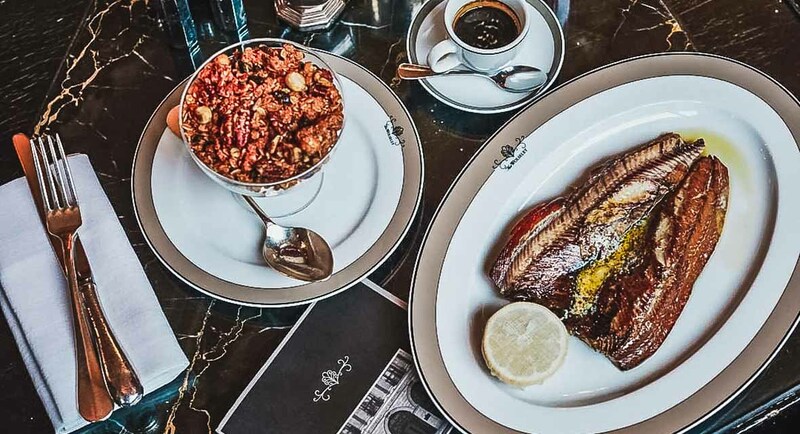 And, since afternoon tea for a treat has become a tad predictable, we’ve put together a list of our favourite London brunches, so you can start the day in style. Be sure to reserve your table soon – the best brunch in London books up fast. This city hotspot at The Ned boasts no fewer than ten restaurants. Our favourite brunch here is at Millie’s Lounge – particularly the ham hock hash with a luscious Clarence Court egg on top – but any of the eateries here will have you feeling deservedly spoilt. Breakfast at the Ritz is just as decadent as its famous afternoon tea. It’s served in the hotel’s opulent Michelin-starred restaurant, with an indulgent Continental buffet, cooked specialities to order and even a spot of caviar, if you really want to get into a special someone’s good books. Breakfast at the Wolseley is such an institution that A.A. Gill wrote a book about it. Surrounded by spectacular Art Deco design, you’ll enjoy exquisite Viennoiserie, smoked kippers, devilled kidneys and a fine selection of Austrian coffees. Mayfair’s quirkiest restaurant, Sketch, takes brunch to another level. Served in The Glade, its ‘evergreen enchanted forest’, treat yourself to the French Toast Suzette and poached tempura eggs. This fabled New York bakery’s only London outpost is most famous for its Cronut®, but breakfast in its little flowered conservatory is the perfect way to celebrate a special occasion. We like to start with a spicy chorizo croissant, followed by a pistachio and rose bostock. Rail House takes brunch very seriously, with quirky takes on classic dishes – their signature Burgerdict, to name just one – as well as healthy and delicious items for the more calorie-conscious mama. Don’t miss the house-blended juices in particular. If you like British classics done brilliantly, you’ll love the Cley Smokehouse kippers and boiled eggs with soldiers, all surrounded by Ham Yard’s gorgeous décor and some of the friendliest service in town. What better way to mark the day than by shopping and brunching at the Queen’s favourite department store? Breakfast Fortnum & Mason is an elegant affair, with a variety of rarebits, indulgent duck egg dishes, and French toast with roasted plums for those with a sweet tooth. Why not make a weekend of it and book your stay in London.